More than ever, organizations rely on the support of training to execute strategy and change. At the same time, most training as it is designed today is too “event” based and does not engage learners in a meaningful and effective performance improvement process. This program will give you the tools to make training programs that create new and lasting behaviours and results. In finishing the certification, you’ll have a complete program ready to deliver, and you can offer this immediately as a new offering to your clients. 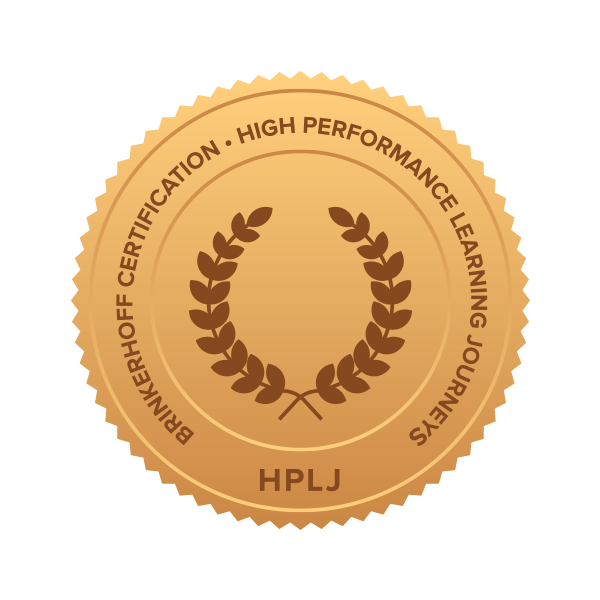 The High Performance Learning Journey® (HPLJ) approach has been proven to dramatically increase the impact of training on workplace performance. In this online program you will use practical tools and methods to integrate performance improvement concepts and fundamental learning theories into your own best-practice design that drives sustained behavioral change, improves workplace performance and creates lasting results. 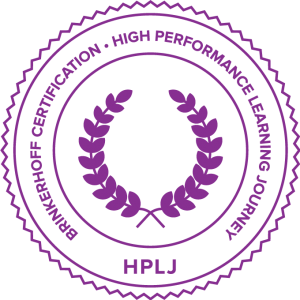 The HPLJ certification program is highly hands-on, giving you guidance in and experience of using powerful tools and proven techniques that you will put into practice in your own training programs during the certification process. The program is intended for learning professionals. You will join a cohort that includes instructional designers, facilitators, HR managers, learning and development professionals/project managers, performance consultants, and others who wish to transform training to increased performance. This online program is a mix of webinar sessions and individual assignments between all sessions. During the program, you will use practical tools and templates to assess, improve and build training programs that creates performance change. The program is created as a high performance learning journey and is delivered in 3 phases that gradually increase in difficulty and level of your accountability. The first two phases comprise 4 x 2,5 hour live webinar sessions spread out over 6-8 weeks. Each of the webinars will be supported by a series of assignments to complete before and after the session creating a cohesive flow through the program. (You should plan 1-3 hours to complete assignments between sessions). The final phase of the program is entirely self-paced and can be initiated at any point within 6 months of completing the first two phases. When is this in my TimeZone? See the time in your timezone here. Choose what information you want from Promote here. “The Brinkerhoff Certification for creating High Performance Learning Journeys was an amazing experience and perfectly timed as I have moved away from an ‘event-based’ approach to viewing learning as a continual process. “Creating learning that sticks and that is directly related to better job performance is a daunting task. This ambitious challenge is what the Brinkerhoff Certification Program addresses in a very successful way with its High Performance Learning Journey. The great strength of the method that it takes its point of departure in the business need that the training intervention is to address and then on the basis of that defines the learning objectives. “Completing the Brinkerhoff Certification and learning to use Promote has been a very useful and rewarding process. Our organization is using the design process and Promote to increase our ability to support coaching and collection of performance evidence that allows us to ensure that what we support people learning transfers into practice and achieves the desired results. The Promote platform, and the design process helps to sharply focus the learning, align the practices that demonstrate use of the knowledge and skills taught, and achieve measurable results. Using Promote we can review the performers’ progress and outputs, give feedback, and support peer coaching and social learning. I want more information about the Certification! The Brinkerhoff Certification – for High Performance Learning Journeys® is also available as a traditional classroom training. If you want to invest in an in-house training program we recommend the face-to-face version. Robert is the internationally recognized expert in training effectiveness. For the last 40 years, he’s done research and studies on what actually makes a training program deliver results in an organization. Robert is recognized with the ASTD Exceptional Contribution to Workplace Learning and Performance award and the Neon Elephant award for creative contributions to workplace learning. The professor is author of sixteen books on training effectiveness, and has been a keynote speaker and presenter at hundreds of conferences and institutes worldwide.